Dear poet, I humbly disagree. April is far from cruel. For those of us who endure Winter’s long months and embrace wholeheartedly the departure of snow and ice – April, with it’s spring rain and sun warming the dull roots to life, coaxing the bright green leaves from beneath the crust of melting snow and into broad daylight; with the return of migrant birds to nest in the waters outside our windows; with newly purchased vegetable and flower seeds for our gardens just waiting to fulfil the potential of their tiny existence – April is a month of hope and renewal. And, with April comes asparagus. Easter came in March this year, and with it, asparagus too early for its time and flown in from too far away from its origins – some farm in Peru. Now, it’s still too early for Finnish asparagus; for that we wait until May. However, our dear European friends in Italy have an abundance of asparagus, thanks to enviable warmer climates, and those slender, bright green spears fill the shelves of local supermarkets right now. 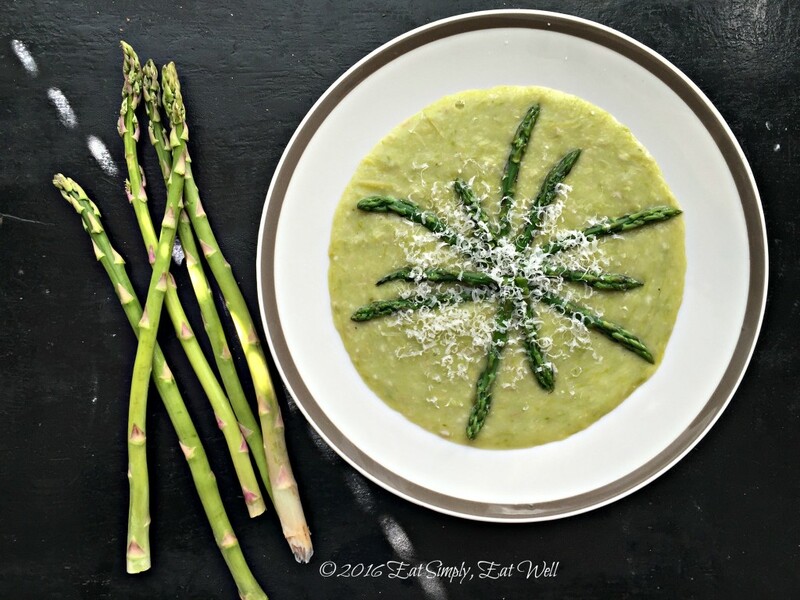 And so it’s asparagus in the morning with eggs; asparagus on toast; asparagus steamed to eat with just a little salt and nothing else, and a simple asparagus soup, like this one. This asparagus soup has a secret ingredient, though, to add a smoothness and thickness that asparagus lacks on its own: oatmeal. Typically reserved for breakfast, oatmeal can be undervalued as an ingredient in other meals, but I’ve been adding it to soups lately, and the boost of creamy texture, heart-healthy fiber, and blood sugar regulating properties are only further enhanced by the fact that it makes a soup so much more satisfying to eat. You’re going to love it. it has a high respiration rate, the metabolic activity in the plant that breaks down the starch and sugars. This means that asparagus is not a vegetable you want to keep hanging around in your refrigerator for many days after purchase. Try to use asparagus within 48 hours or so after purchase as the quality and level of nutrients start to deteriorate pretty quickly. Eat up and enjoy! Asparagus can be eaten raw, roasted or lightly steamed – but it needs very little cooking time; and in fact, long cooking periods tend to negate much of its nutritional value. The easiest way to cook asparagus is to trip the bottom ends by about 1/2″/1.5 cm. Then place just enough water in a pot to cover the bottom, bring it to a boil, add a small amount of salt, place the asparagus spears in, cover, and steam for one minute. Pour the water out and serve hot, warm or cold. 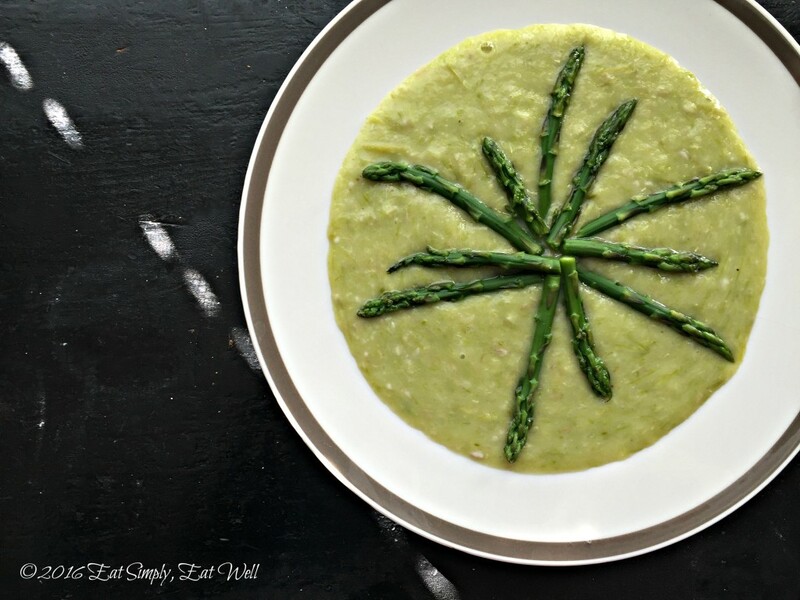 This asparagus soup is simple, quick and delicious – exactly what you hope for when your moving at full speed the rest of your day. So get this short list of ingredients ready and settle in – your soup will be ready in no time. Prepare the asparagus: Cut off the bottom 1/2″/1.25 cm of the asparagus and discard. Cut off the tips of the asparagus so that each tip is about 2″/5 cm long. Set aside. Cut the remaining stalks of asparagus into chunks. Heat the olive oil in a heavy-bottomed pot over medium heat, then add the onion and leek. Cook slowly until translucent and very tender; about 10 minutes. Add the garlic an cook for one minute more. Add the asparagus chunks, oatmeal, water and salt. Bring to a boil, reduce heat to as simmer, and cook for 5-6 minutes or until asparagus is tender. Remove from heat, and using an immersion blender, puree the soup until smooth. (If you don’t have an immersion blender, transfer the soup in small batches to a heat-proof blender and blend until smooth. Return the soup to the pot and rewarm if necessary). Place a small pot over the stovetop and pour in 1/2 cup water, or enough to cover the bottom. Add 1/4 teaspoon salt and bring to a boil. Add the reserved asparagus spears, cover with a lid, and steam for one minute. Remove from heat and drain the water. 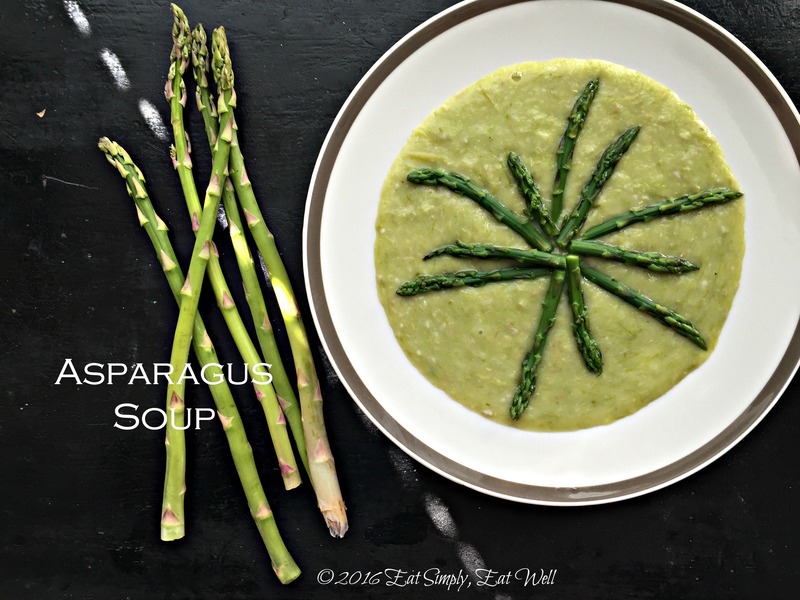 To serve, divide the asparagus soup evenly between four bowls. Arrange the asparagus spears on the top, and if you wish, grate fresh Parmesan cheese over the top and serve with toasted sourdough bread. Do you have other tips to share about how you cook asparagus? Let me know in the comments below! And if you like this recipe, please share it with your friends! If you haven’t already, be sure to sign up for our newsletter before you go (it’s back up on the right at the top of the page). To your health & joy. Soup recipe is simply, thank you for it! Have a nice day!